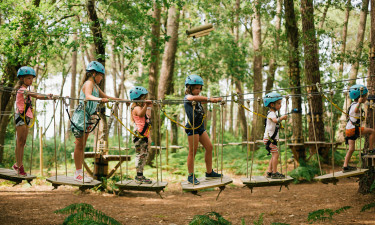 Set on the edge of Lake Biscarrosse and surrounded by pristine pine forests, Mayotte Vacances is the perfect place for nature-loving families to use as a base while getting to know the Landes region of France. Whether you prefer to be active or simply want to unwind, the perfect luxury camping experience is waiting to be enjoyed. There are beaches lining the salty water of the Atlantic Ocean, are located close to Mayotte Vacances and are waiting to be enjoyed by beach bunnies. The area also features historical towns and villages to explore. Why choose Camping Mayotte Vacances? Guests simply need to take a few steps from their mobile home to reach the impressive outdoor water park located in the heart of Mayotte Vacances. 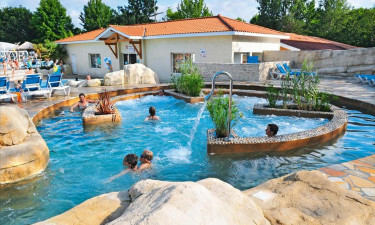 The main pool is set with sun loungers and features a waterslide, while a nearby lap pool is covered with a solarium.